By most accounts, Tate was born George Holmes Tate on February 22, 1913, in Sherman, Texas. He began performing in 1925 while still in his teens when his brother handed him an instrument and asked him to play tenor saxophone with the family quartet called McCloud's Night Owls. Tate and the Night Owls learned to play largely by listening to recordings by Louis Armstrong and mimicking the sound. The band toured professionally for the next four years, after which Tate continued to play the horn, performing with a series of territory bands and with circus bands until the early 1930s when he toured the south-western United States with Nathan Towles' band. During those early years, Tate spent time with Terrence Holder's band from 1930-33 and toured with Andy Kirk's Clouds of Joy in 1934-35. In 1934 Tate filled in briefly with Count Basie's Orchestra as a replacement for Lester Young. Young eventually returned to the band, and Tate joined up with Towles for another four years beginning in 1935. Tate worked with Towles until 1939 when Herschel Evans, who was Basie's tenor saxophone player, died. Basie then brought Tate back into the orchestra as a permanent fixture for nearly a decade. Perhaps nowhere was the contention for attention between saxophone players of that era more pronounced than among Basie's sidemen. Among the notables were Illinois Jacquet also one of the so-called Texas tenors, Lucky Thompson, and Young, all of whom along with Tate transformed moments of the orchestra's performances into full-scale dueling sets between horns. Tate was heard on many recordings by the Basie orchestra during that era, including selected recordings where Tate performed on alto saxophone as well as tenor. He emerged from Basie's band as a seasoned professional. After Tate parted ways with Basie in 1949, Tate appeared with Hot Lips Page, Lucky Millinder, and Jimmy Rushing until 1952. He then assembled his own house band at Harlem's Celebrity Club in 1953, marking the start of a gig that lasted for 21 years, until the early 1970s. Tate's European tours brought him largely to France where, in 1967 and 1968, he performed as bandleader in a trio comprised of Milt Buckner on organ and Wallace Bishop on drums. Tate and Buckner recorded a series of tenor saxophone and organ duets in 1967 on the Black and Blue label, including “Buddy Tate with Milt Buckner,” which is revered among Tate's best works. He made two earlier European tours as a sideman for Buck Clayton, in 1959 and 1961 respectively. In 1967 Tate also appeared with John Hammond in a concert program called Spirituals to Swing and toured with the Saints and Sinners. Tate spent time in the 1970s as a sideman in the Benny Goodman Orchestra. 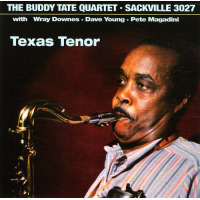 Tate's 1973 release, “Buddy Tate and His Buddies”, featured his former Basie cohort, Jacquet, pianist Mary Lou Williams, and trumpeter Roy Eldridge. Also numbered among the buddies were guitarist Stan Jordan, drummer Gus Johnson, and Milt Hinton on bass. The album, one of Tate's more popular recordings, was re-issued in 1994. In the 1980s, Tate toured extensively with Jacquet's group called the Texas Tenors. The Tenors followed a festival circuit that took the players to the Newport Jazz Festival in 1980 and to the festival in Cork in 1983 and again in 1985. His festival tours with Jacquet in the 1980s included annual visits to the Grande Parade du Jazz in Nice, France. Additionally, Tate's North American agenda included both live and taped performances with Jay McShann and Jim Galloway in Canada. 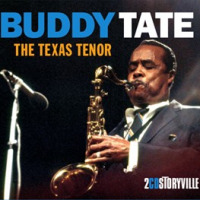 In 1978 Tate taped a collection of recordings for Muse Records under the bill of Buddy Tate & the Muse All Stars.” Those albums included “Live at Sandy's,” “Hard Blowin',” and “Muse All Stars.” In 1991 Tate joined fellow tenor saxophone player James Moody and a collection of others among his peers on the live recording, “Lionel Hampton and the Golden Men of Jazz.” The 1996 album “Conversin' with the Elders,” by saxophonist James Carter marked what would become Tate's final appearance on record. He remained active and performed with Lionel Hampton and the Statesmen of Jazz in the late 1990s until a bout with cancer left him incapacitated. In January of 2001 Tate moved to Phoenix, Arizona, to live near his daughter. He died in Arizona soon afterward, in a nursing home in Chandler on February 10, 2001. All About Jazz musician pages are maintained by musicians, publicists and trusted members like you. Interested? Tell us why you would like to improve the Buddy Tate musician page.